UTHealth School of Public Health Logo. Image available on the Internet and included in accordance with Title 17 U.S.C. Section 107. Portrait of Reuel A. Stallones. Courtesy of the University of Minnesota. Image available on the Internet and included in accordance with Title 17 U.S.C. Section 107. UNIVERSITY OF TEXAS SCHOOL OF PUBLIC HEALTH. The Texas legislature authorized the establishment of a school of public health within the University of Texas System in 1947, but did not vote an appropriation until 1967. 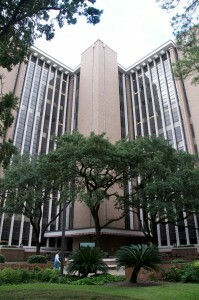 The school, located in Houston at the Texas Medical Center, was activated in September of that year, and John Randolph Hall, Jr., was named acting dean on a part-time basis. He was succeeded by James H. Sterner, who served until August 1968, at which time Reuel A. Stallones was named first dean. Stallones held the post until his death in June 1986. 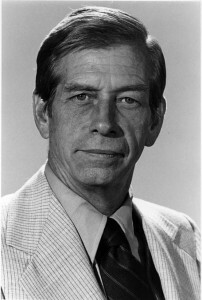 Roger Bulger, president of the University of Texas Health Science Center at Houston, acted as interim dean until R. Palmer Beasley was appointed in June 1987. In the period between activation of the school and the completion of its original structure, students received their training at various locations within the medical complex in Houston. Local institutions contributed laboratory and classroom space, and community resources were made available by state, county, and city health officials, industrial organizations, private practitioners, groups of individuals, and hospitals. The first building was occupied in November 1971 and housed the school until December 1976, when a second building was completed. The objectives of the school are to provide academic instruction relevant to public health, to serve as a focus of research activities directed toward community health problems, and to provide service to and maintain strong relations with public health practice. The basic organizational unit of the school is the teaching-research module, in which a group of faculty members and graduate students work as a learning community investigating an important area of public health concern. This structure serves to bring teaching and research together physically, organizationally, and conceptually. UTHealth School of Public Health located in the Reuel A. Stallones Building in the Texas Medical Center. Courtesy of UTHealth School of Public Health. Image available on the Internet and included in accordance with Title 17 U.S.C. Section 107. Financial support for the school is a combination of state funding and sponsored projects. The school also receives limited funding for student assistance, research, and the Dean's Excellence Fund from the UT Health Science Center Annual Campaign. The School of Public Health is accredited by the Council on Education for Public Health, and the M.P.H. degree program satisfies the academic requirement for certification by the American Board of Preventive Medicine in four specialty areas. The school is also accredited by the Southern Association of Colleges and Schools. The M.P.H., Dr. P.H., M.S., and Ph.D. degrees are offered at the Houston campus. Satellite campuses were established in San Antonio in 1979, in El Paso in 1992, in Dallas in 1998, and in Brownsville in 2000; all four offer only the M.P.H. degree program. The school serves as a World Health Organization Collaborating Center in two research areas and participates in concurrent degree programs with several other degree-granting institutions. The faculty of the school grew from the original three members to eighty-six in 1992. The first regular class was admitted in 1969, when forty-two students were enrolled. In the fall of 1990 the combined enrollment in Houston and San Antonio reached 649. Enrollment in the fall of 1999 was 922, and the faculty numbered 151. At that time the school had graduated more than 3,200 students. The library maintains specialized holdings in a number of relevant public health areas, including epidemiology, infectious diseases, nutrition, environmental sciences, and occupational health. Houston Tribune, August 31, 1967. Texas Health Bulletin, October 1967. Vertical Files, Dolph Briscoe Center for American History, University of Texas at Austin (Health Science Center, Houston). Handbook of Texas Online, Peggy Amante, "UNIVERSITY OF TEXAS SCHOOL OF PUBLIC HEALTH," accessed April 21, 2019, http://www.tshaonline.org/handbook/online/articles/kcu37. Uploaded on June 15, 2010. Modified on July 24, 2017. Published by the Texas State Historical Association.